Plot: Unsummon a creature in this lane with less power than Camonna Tong Heavy. Camonna Tong Heavy is a rare Strength creature card. It is part of the Houses of Morrowind expansion. In addition to the card's availability in the Houses of Morrowind expansion, two copies are included in the Hlaalu Schemes theme deck. 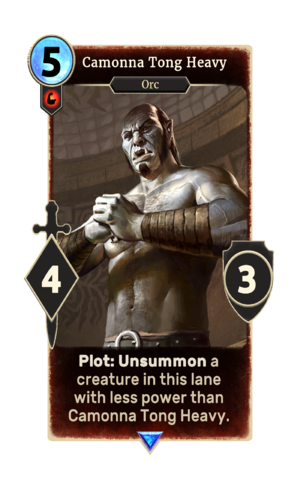 This card likely depicts Lorbumol gro-Aglakh, who first appeared in Morrowind as a corrupt member of the Fighters Guild. He, along with others of the organization actually worked for the Camonna Tong. "Maybe I got time for you, and maybe I don't." This page was last modified on 2 March 2019, at 00:13.